Attract Millennials To Your Local Business! As consumers, Millennials spend over £350 billion a year. They are also spending less time watching TV compared to viewing videos and sharing personal experiences on their mobile devices. At Boost My Profit, our ability to scale Snapchat Ads will helplocal businesses to engage and deepen their influence with this valuable audience. This is a perfect channel for local businesses to reach Millennials. Snapchat leverages Direct-to-Audience video interactions which makes it easier to engage your audience with your marketing message. 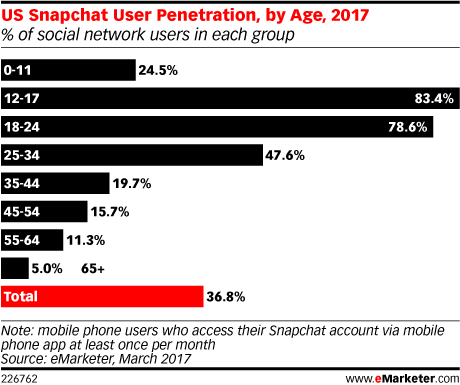 SnapChat has a huge potential for SMEs to reach and connect with Millennials and Gen Z. Snap Ads have an engagement rate 5X higher than the average click-through rate of other social platforms. Snapchat has a unique daily reach of 35% of 18-34 year olds in the U.K.
Local Businesses Are Now Able To Achieve Both Brand Awareness and Direct Response Goals With Highly-Interactive, Mobile Video Snap Ads. Snap Ads are a highly-engaging mobile native ad format that allow local businesses to connect with Snapchatters through creative visual storytelling. Our Snapchat Advertising services consist of two phases. The first step is to identify how to target your ideal patients on Snapchat using interests, demographics, and custom lookalike audiences. We will conduct research to identify the best possible targeting opportunities. The second step is to draft your ad copy to make sure your ads, offer, and landing page are all congruent with your target audience. The third step is to create your landing page(s). A landing page is the page the prospect “lands” on after clicking your ads. Having a good landing page will convert more visitors into leads and sales. The fourth step is to install online and phone call conversion tracking so we can measure the number of leads and sales generated directly from your campaign. Conversion tracking will enable us to calculate your return on investment (ROI) and see exactly which ads are profitable. We will test different ad and landing page copies to improve the ad click through rates and sales conversion rates as part of the management service. A/B split testing is the process of testing 2 different versions of ads or landing pages (i.e. version A vs. version B) to see which one performs better over time. Once the campaign is profitable, then we will work to expand to drive even more appointments and patients.